Empire Hair Co. is Austin's Kérastase salon offering cuts, color, keratin, and pretty much anything hair related. We have a beautiful boutique now as well including jewelry by MantraBand, Sorrelli, and B.B. Lilah, body care by Lollia, and every product Kérastase makes! Open daily for shopping, and we host occasional LuLaRoe pop up parties! Her childhood dreams have come to fruition in Empire Hair Co. She eats, breathes, and sleeps beauty, hair, fashion! 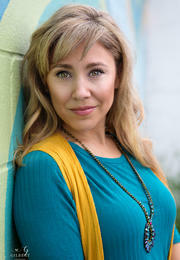 Jessica is a stylist and makeup artist, specializing in color and textured cuts. She has been in the industry for 20 years now but is always looking to further her education by learning new techniques and working with the latest products to maintain her creative edge. She is a third generation Austinite and loves this city, always trying to make it a more beautiful and colorful place... through her actions and her her clients!